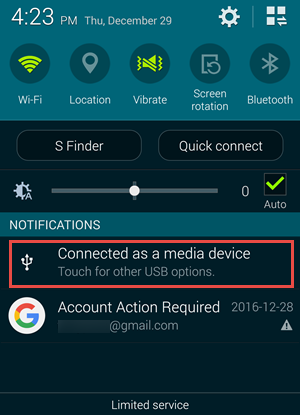 The week after i purchased the device, i was able to access my files connecting the USB cable to computer.And later on when i connected, it did'nt show me the options in the notification panel. Just Go to Developer Options there is option USB Debugging makebit enable then you can access your phone files on computer just aware that whenever your device get lock your files won't see on computer.If You doesn't have developer Option.Then just Goto About Phone and tap thrice on Build Number. Tap on Connected as a Media Device.There is a pop up option then select appreciate option.I think you have samsung device so i didn't get idea about pop up menus.you can share pop up screenshot with me i am definitely help you. connect your nokia to the PC and open device management and search for portable devices and check if there is no exclamation mark! at the Nokia 6.1, there is an exclamation mark click then right mouse and choose update driver and choose automatissch.if it still works then remove the Nokia 6.1 driver and then have it reinstalled. Just Goto Settings>System>Developer Options>Default USB Configuration> Set as File Transfer.If you have windows 7 then it will works it's not working on Windows xp. But i also tried using it in my friends laptop but still i had to face the same issue. I have the same problem. Nokia-6 phone suddenly stopped being recognized by PC when plugged in USB. I tried the development options - "USB debugging" - didn't worked. From Windows side I can see only "USB device not recognized" message and "A request for the USB device descriptor failed." in Device Manager. This is very well used phone from less of one year. Nothing to do with the previous Nokia phones. Very disappointing! (2) Type "wpdmtp.inf" in the search bar provided to the right of the address bar in Windows 10. Unable to fix it so far. If.you have any lead please let me know.